Spin Control: Hundreds of bills getting signed into law in Washington state. Here are some of them. In the weeks after the session, all of those good little bills – and the bigger ones – that managed to wend their way through the process wind up in a stack on a massive conference table for Gov. Jay Inslee to sign with a bit of fanfare. Supporters get ushered into the governor’s conference room and arranged around the chair where the chief executive sits. A few pleasantries are exchanged with lawmakers, some of whom had almost nothing good to say about the governor during the session. A brief synopsis prepared by staff is read by Inslee. With a flourish of the pen, he affixes his signature. An admonition is made to smile for the camera, followed by a couple of flashes. Pens all around. Supporters are ushered out the far door while the next bill’s fans come in the one near the governor’s seat. Sometimes a huge crowd shows up. Sometimes not even the prime sponsor comes by for the ceremony. The process generally runs smoothly, although once last week Inslee signed a different bill than he was describing. 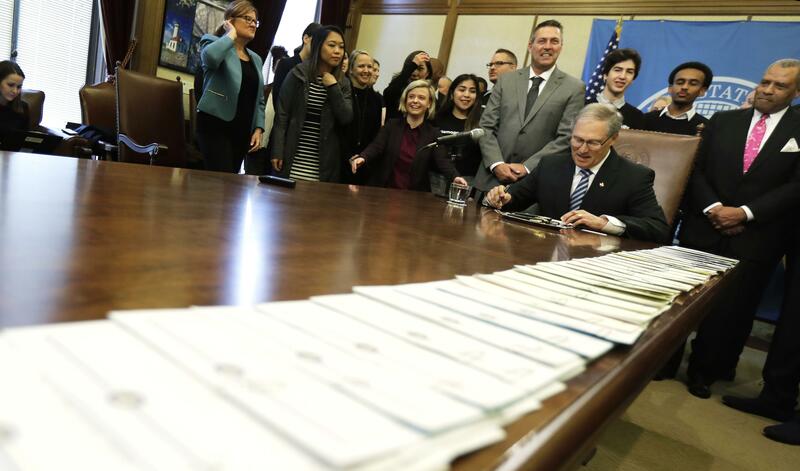 But the Legislature passed more than 300 bills, and they have to be signed or vetoed by the end of the month, so subtracting out weekends and days when Inslee’s not in the capital, he’s signing between 30 and 50 bills at a clip. Dreamers: While Congress and the Trump Administration continue to fight and point fingers over the Deferred Action for Childhood Arrival, or DACA, program, Washington state will allow Dreamers to qualify for the College Bound Scholarship program and renew their Opportunity Scholarships. That will continue even if DACA is terminated, suspended or modified. School curriculum: Washington is going to develop a more complete civics program, making each high school offer a stand-alone class by the 2020-21 school year, and the Superintendent of Public Instruction office is taking over the Washington History Day Program from the Historical Society. Speaking of history, Washington students are going to get better instruction in Native American culture in their Pacific Northwest history courses. For-profit colleges: The state will crack down on unfair trade practices by for-profit colleges and private vocational schools, looking for misleading endorsements, the sale of student loans that financially benefit the institution or the use of U.S. military logos in ads. The schools will also have to report performance data and the Student Achievement Council will set up a system for students to file complaints. PFAS restrictions: The state will tentatively ban perfluoroalkyl and polyfluoroalkyl substances in food wrappings in 2022, provided adequate substitutes can be found. PFAS are resistant to oil, stains, grease and water, so they are often used in packaging. But they’ve also been linked to some cancers and other health problems, so the Department of Ecology is developing a chemical action plan to replace them. If that happens, Washington would be the first state to ban PFAS in packaging. Those are the same chemicals causing problems in water supplies around Fairchild Air Force Base and other military installations that use fire retardant foam with PFAS. A separate bill to address the use of foam is scheduled for action Tuesday. New animals in the neighborhood: Before the Department of Fish and Wildlife relocates or introduces wolves, bobcats, lynx, coyotes or big game animals into an area, they’ll have to hold a public hearing in the community most affected by the move. They’ll also have to prepare a summary that explains what animals, how many, where the critters will be released and where they are likely to roam. Stem cell therapies: Doctors who perform therapies that have not been approved by the Food and Drug Administration will have to tell patients the therapy isn’t approved and obtain a written informed consent first. Grandparent visitation rights: The rights of grandparents and other relatives to visit children after the parents divorce has been in question for 13 years because of a state Supreme Court ruling that said the fit parent awarded custody has the right to control visitation. The Legislature approved a process that allows a grandparent or other relative to request a court order for visitation if there’s a substantial relationship and denying visitation risks harm to the child. The definition of relative is pretty broad, but it doesn’t include a person whose parental rights have been terminated or relinquished. Bone marrow donors: People who renew or apply for a driver’s license will soon be getting written material about bone marrow donations. It’s another first-in-the-nation bill for Washington. Write-in candidates: A person running a write-in campaign for an elective office must file a declaration of candidacy before the close of balloting on Election Day for those votes to be tabulated. Under current law, a write-in candidate must pay the standard fee of 1 percent of the annual salary when filing that declaration. Starting in June, they’ll be able to skip the fee if they file more than 18 days before the election. After that, they’ll owe the fee. This is just a sampling of the bills signed last week. To get the rundown on all the bills signed, go to the governor’s website, www.governor.wa.gov, and click on Bill Action.